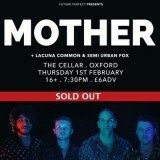 More Oxford music greatness ...One of many great new tunes being released from MOTHER. I loved producing and mixing this album here at Ox-4-Sound. Loads more coming soon.